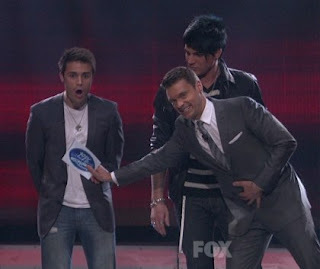 American Idol Results Recap: Just How Did We Get to a Kris/Adam Finale? Now my objectivity will be broken down simply into who owned each Tuesday night, when looking back at the past nine performance episodes (a.k.a., the beginning of the Top 13). Which brings the score to .... Gokey: 2, Kris: 4, Adam: 4, and Matt G.: 1. Which part of the night was your highlight? 3) The scantily clad "bra girl" who charged Adam, and Adam handling it like a pro. -- The situation, that is. As in, he charmingly laughed it off. Who was more of a look-a-like last night: Bill Hader (the Museum movie promo guy in the beginning) looking like Zac Effron; or that guy sitting next to Kevin Bacon looking like the twin of Randy Jackson? Which was more disturbing for you to see: Allison Iraheta in the audience or a Gokey homecoming fan holding the sign "Scream On"? And last but not least, just where in the hell can I go find me one of those "Adam Lambert" capes? I must get me one so that I can tie it around my neck and run up and down my street as fast as I can once Adam Lambert is announced as "The Next American Idol"!!! (Oops ... I forgot. I was being objective.) Do post your thoughts below! totally agree with your post. People rant about how inconsistent Kris has been, but he and Adam have been the two most consistent. I think we have the right top 2.
enjoyed your blog. I can't argue with your picks. I would have given Adam a close second for "Born to Be Wild" on Songs From the Cinema week. Allison recieves a tie with Adam from me for Motown's Greatest Hits week "Papa Was a Rolling Stone"
Great blog. For me the best moment came last night when Kris was safe. I jumped up and did a happy dance and screamed. I'm loving it. It was so cute that Kris' dad was wearing dark glasses but you could tell he was crying like a baby anyway.. I'm happy for Kris for making it this far, although I'd had my heart set on an Allison-Adam final.. congratulations Kris, but nothing's gonna make me stop supporting Adam till the end. GLAMBERTS UNITE!!! Well our Top 5 performed the Rat Pack Standards last night, and when it was all said and done, I must say . . . I felt a little swayed. I have to use the word "swayed," first of all, because it's my clever pun on a popular song during the Rat Pack era; and secondly, because the night didn't make me into a full-blown convert -- it simply swayed me, like a gentle yet confused little branch blowing in the wind, unsure if it wants to waver on back to the safe side of "Adam & Simon," or dare to venture and possibly snap on over to the unfamiliar side of "Danny & Kara." Considering I kept busy on my computer all the while Idol played out tonight on my TV screen, only giving the occasional glance up to notice that Lee Dewyze got his hairs cut, Kara got her hairs styled in a flattering manner that I can't quite put my finger on as to why they were so flattering and Simon's buzz cut looked especially unflattering ... I guess you could say it was all one big unnoticeable snooze fest until Crystal "Mamasox" Bowersox took the stage. So really, all I care about commenting on is her for now. American Idol Results: Adam Lambert PERFORMS!!! Oh yeah, and There Was a Double Elimination. Okay, guys, here we go with the Idol results. Am I the only one who is sick of these results show intro package fake-outs? You know, wherein they try and make us believe like there were Holyfield vocal TKOs last night? (Cut to a judge exclamatory: "Yo, those vocals were hot!!" Then cut to Andrew Garcia holding a mic that looks as if it just turned gold right before our very eyes.) Um, am I living in some crazy Harry Potter land? Because I'm pretty sure this does not accurately reflect what went down on performance night at all. But then again, I guess if they show what really went down, it would not pump me, the viewer, up. Unlike those high voltage group sings ... those aren't watered down or lip sunk at all. Oh what's that?! Ms. Sleepy Weird-Eyed Gal Herself, Brooke White, and some dude I've never heard of are set to sing tonight?!!! Well somebody better hold me back!